1-3/8" All steel frame with Dupont thermoset baked-on, powder coat finish will not chip, peel, rust or corrode. Triple-layer, ripstop fabric is 100% waterproof. Enhanced weave polyethylene cover, UV treated inside and out. Easy Slide Cross Rail system locks down and squares up frame. Bolt together hardware at every roof joint connection. 5 rib / 5ft spacing design delivers ultimate strength, ease of installation, portability and best in category value. Patent Pending ShelterLock stabilizers ensure rock solid stability. Delivers a stable, more durable shelter. 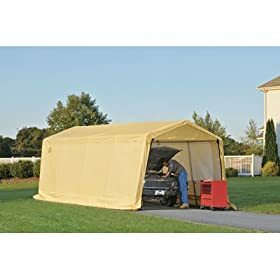 Measuring 10 feet by 20 feet, the AutoShelter from ShelterLogic provides great cover for your cars, motorcycles, ATVs, trailers, lawn and garden equipment, tractors, snowmobiles, or other vehicles or gear. The shelter features a 1 3/8-inch all-steel frame with a DuPont powder-coat finish designed to resist chipping, peeling, rust, and corrosion. The five-rib, 5-foot spacing design delivers optimal strength, portability, and ease of installation. Patented ShelterLock stabilizers further increase the shelter's toughness. The triple-layer, ripstop polyethylene cover features an enhanced weave and is 100 percent waterproof. It's UV-treated inside and out, and it includes fade blockers and anti-aging, anti-fungal, and anti-yellowing agents. The cover is designed for a drum-tight fit. The total weight of the product is 134.6 pounds. The cover fabric, end panels, and framework are covered by a limited one-year warranty against defects in workmanship. ShelterLogic has a unique history of strategically partnering with customers to meet and exceed their unique outdoor product requirements. Driving innovation since 1991, ShelterLogic is evolving into a leader in design, manufacturing, and distribution of high-quality outdoor products. Headquartered in Watertown, Connecticut, ShelterLogic owns and operates manufacturing in the United States and China.